Familia Martínez Bujanda’s wineries have attended ProWein 2019 and Fenavin 2019, two of the leading trade fairs for the wine industry worldwide. 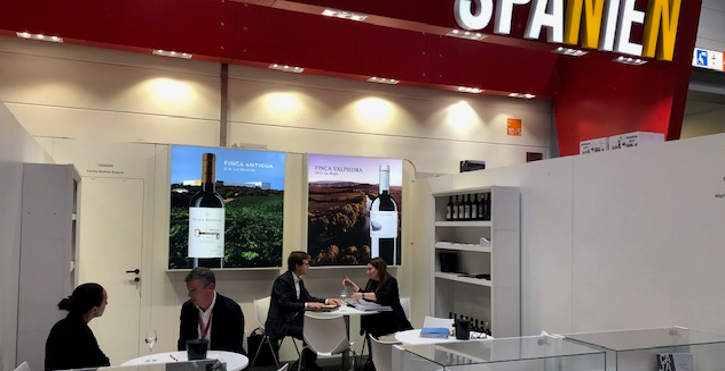 Familia Martínez Bujanda has attended, as it does every year, the world’s most important event for winemakers: ProWein 2019. Held in Düsseldorf, Germany, from 17 to 19 March, this trade fair was the stage for the presentation of new vintages and other new developments from Familia Martínez Bujanda’s wineries. The 25th ProWein welcomed more than 60,000 trade members from 133 different countries. ProWein is considered to be the largest meeting for professionals in gastronomy and the wine-making industry. Visitors could sip wines from wine regions in more than 64 countries at the stands of 6800 exhibitors. Finca Valpiedra, Viña Bujanda, Finca Antigua and Finca Montepedroso represented Familia Martínez Bujanda at the event, which attracts the best-known wine-growers from all over the world. Familia Martínez Bujanda set up a stand (A234) in Hall 10, where ICEX organised tastings and other wine-related events. Finca Valpiedra was part of the stand of the Government of La Rioja and the DOC Rioja Regulatory Council, where our wines were stars in a number of master classes by wine expert Jürgen Mathäss. In addition, Familia Martínez Bujanda is naturally taking part in Fenavin 2019, the largest trade fair for the wine industry held in Spain. Like in the previous editions, the 10th Fenavin will focus on creating opportunities for the Spanish wine industry both at the domestic and the international levels, finding new markets and distribution channel systems. In the previous Fenavin edition, 1502 wineries and cooperatives from Spain showcased their wines at stands in eight halls. Fenavin 2019 will be staged at the Ciudad Real Convention Centre from 7 to 9 May. At the event, we will announce this year’s news, like the new wine we are making at Finca Valpiedra that captures the essence of traditional Rioja. We will keep you posted! Our stand will be in the Virgilio Hall, at No. 25, Calle 10.